All listed companies on SGX are mandated to report their financial performance periodically. Every quarter, companies must report their financial performance using a structured set of 3 financial statements. 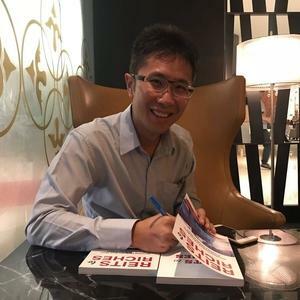 The financial statements adhere to international accounting standards and the local Singapore reporting standards have very similar formats making it easy for investors to review. Financial statements are reported based on time periods. By reviewing the 3 financial statements, investors are able to deduce the financial position of the business and how its financials have changed over time. In order for a business to operate, it first needs to start with some initial funding. This funding can be raised via 2 methods – Debt or Equity. A business may raise money from a lender with a promise to pay back the principle plus interest after a period of time, these funds are known as Liability. A business may alternatively choose to sell shares to investors to raise money, these funds are known as Shareholder’s Equity. From the perspective of the business, both Liability and Equity are monies which the business owes; liabilities are monies owed to creditors while equities are monies owed to shareholders. The cumulative funds raised from both debt and equity can be used to purchase assets. These assets are used in the course of doing business to address a need of society. As simple example, an airline would need to purchase aircraft and fuel while a developer would need to purchase land and raw materials. A business that fails to address a need of society will slowly but surely cease to exist one day. The remaining unused monies are retained as cash for working capital, cash are also assets. Therefore the total amount owed (Liability and Equity) by the business always equals to the total amount of assets owned. The total amount owned and total amount owed are said to be balanced. The course of utilising assets to do business generates revenue. After paying off its expenses, the different is known as the profit or loss of the business. This process coupled with the action of collecting and paying out monies is known as the business cash flow. The cash earned by the business can be either retained by the business for future expansion or returned to the shareholders in the form of dividends. The faster a company can reinvest it's retained cash or pay out dividends to shareholders, the faster it increase its value. The goal of stock investing is to be able to identify, evaluate and understand how fast a business can generate shareholder value by risking our money in exchange for that potential growth in value. The Balance Sheet is also known as the Statement of Financial Position or Condition. The balance sheet provides a financial snapshot of the business at a certain point in time. It is said to be balance sheet because all the assets of a business must be equal in value to the liabilities. Assets are various possessions which the business “Owns” while the liabilities are the possessions that the business “Owes” to another party. Liabilities could either be owed to creditors or to the shareholders. The latter are referred to as Equity. Assets are classified as Current and Non-Current. Current assets are possessions which can easily be converted to cash within one business cycle, the guideline being one year. Examples of current assets are cash, bank balances, short term fixed deposits, inventories for sale and account receivables (outstanding uncollected bills). Non-current assets are possessions which are not easily converted to cash and potentially take more than one business cycle. Examples of non-current assets are the business’ plant, property & equipment (PPE) and investment properties which are typically kept for long periods of time. Similar to assets, liabilities are also classified into Current and Non-Current. Current liabilities are debts which the business needs to pay to creditors within one business cycle. Examples of current assets are taxes to be paid and accounts payable (outstanding unpaid bills) and short term loans. Non-current liabilities are debts which the business needs to pay to creditor over multiple years. Examples of non-current liabilities are long term bank loans. Equity is generally classified into Shareholder’s Equity and Retained Earnings. 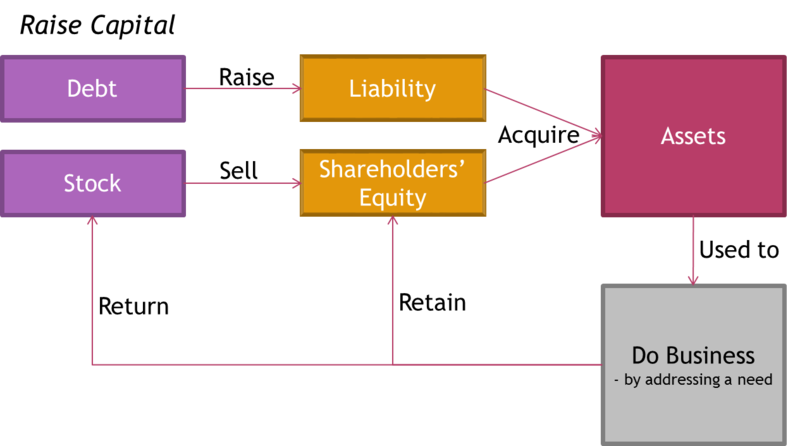 Shareholder’s equity is the total funds raised by the business through selling of its shares to investors. This represents the funds which the business owes to the investors. Retained Earnings (or losses) are the total cumulative earnings that the business has received since the inception of the business. Retained earnings are obligations of the business to the shareholders and therefore classified as equity. 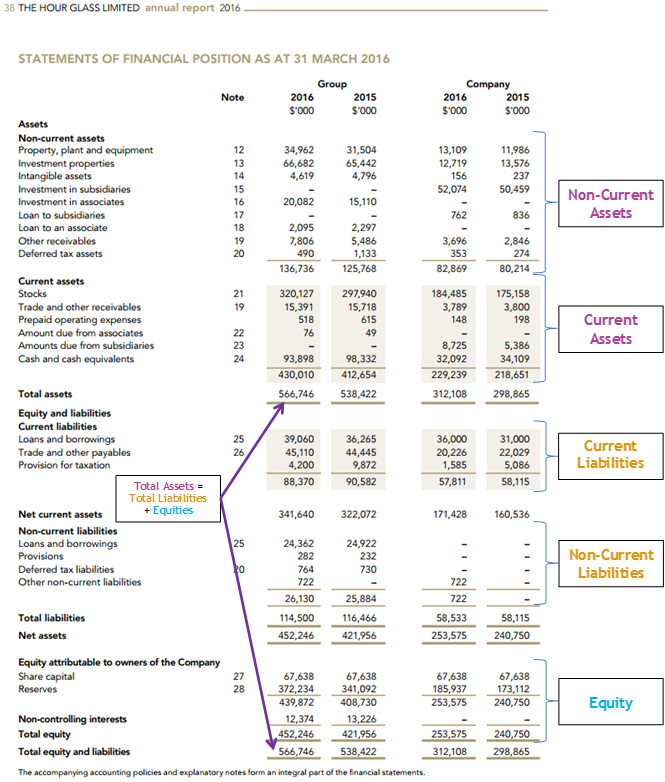 Below is an example from The Hour Glass Limited showing the major constituents of the Balance Sheet. The Income Statement is also known as the Statement of Income, Earnings Statement or Profit & Loss Statement. An income statement measures the profitability of the business over an accounting period. The accounting period could be in quarters, half-yearly, nine-months or yearly. 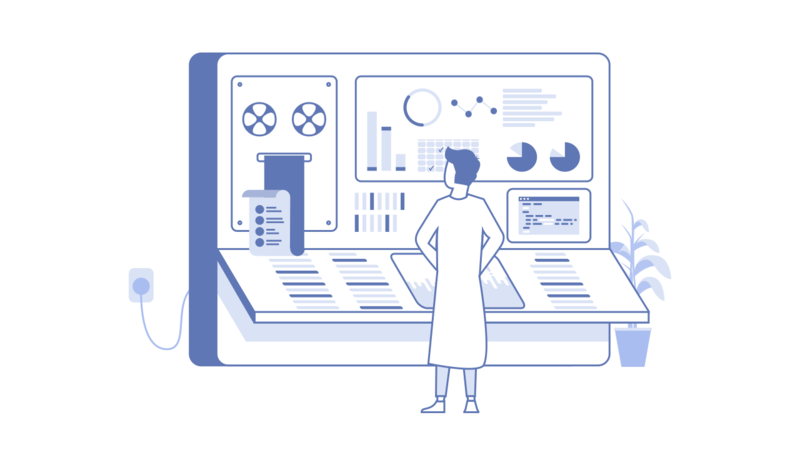 Business operations are continuous, therefore, having a synthetic accounting period in place and a profitability measurement in the income statement is sometimes arbitrary. Businesses go through cycles of ups and downs and sometimes a profitable quarter makes up for another unprofitable one. A periodic measurement of a business is however essential for analysis. Revenue sometimes also known as the top line (because it always appears on the top of the income statement) is the total amount that a company is entitled to receive during and after in the course of its business operation during the accounting period. In other words, the revenue is the amount of sales generated by the business. For each item sold, there is a cost associated with it. The cost to acquire or manufacture this item or good is known as the Cost of Goods. The difference between the Revenue and the Cost of Goods Sold (COGS) is known as the Gross Income. In the course of operations, the business will no doubt incur expenses. Some examples of expenses include employee salaries, rental expenses, insurance expenses, maintenance works, utility bills, marketing & advertising expenses and depreciation and amortisation of assets. These are collectively known as Operating Expenses, alternatively, they could also be called Selling, General and Administrative Expenses (SG&A). After operational expenses have been accounted for, the business is left with the Operational Income. Besides income and expenses related directly to their core business, businesses may also have other side income or expenses. It may also have earned income from non-core business operations such as interest from bank deposits and rental income. Other income could also come from the parent company’s associates and/or joint ventures. It may also incur non-core business expenses such as facilities cost, professional fees and other general administrative expenses. After accounting for all these additional income and expenses, the income received is known as the Pre-tax Income. This is also known as the bottom line. This is the income which the business needs to submit to relevant tax authorities. Deducting taxes from the pre-tax return gives the Net Income. 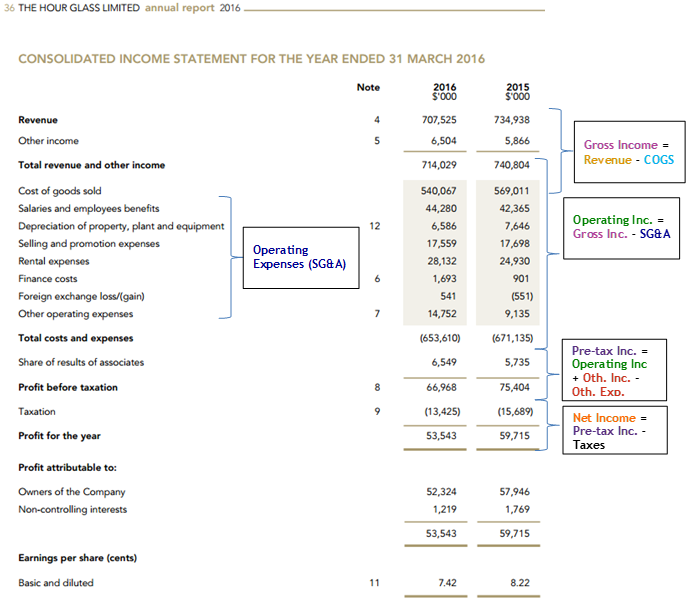 Below is an example from The Hour Glass Limited showing the major constituents of the Income Statement. The Cash Flow Statement is also known as the application of funds statement or flow of funds statement. The Cash Flow Statement records all the business’ cash receipts and payments over an accounting period, similar to the Income Statement. 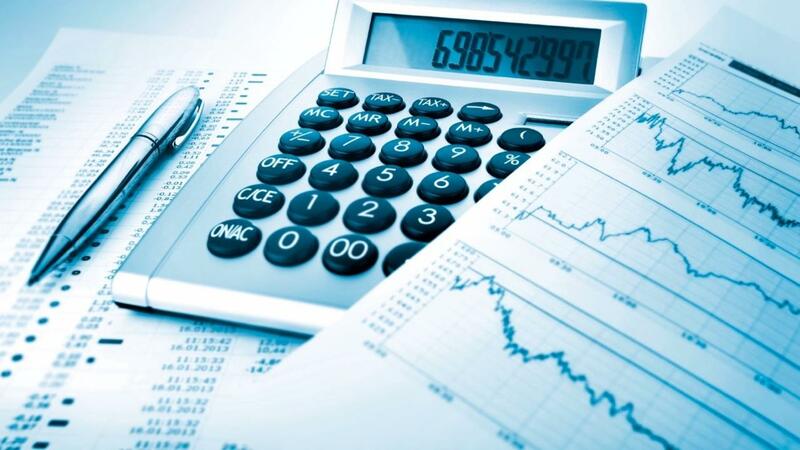 Based on the internationally accepted standard of accrual accounting, revenue is recorded during an economic event rather than at the point when cash is exchanged. An economic event is said to occur when the benefit and risk of a product or service has been transferred from the vendor to the consumer. Most businesses operate on credit terms. The consumption of goods or a service can be given to a customer but the customer does not need to pay immediately until sometime later – usually 30 days. An alternative is that the cash be pre-paid in advance before the consumption of a good or service. Some income and expenses may not actually have been received or paid for in cash. In addition, some components of the income and expenses are non-cash, for example depreciation and revaluation. These are what give rise to differences between the income statement and cash flow statement. 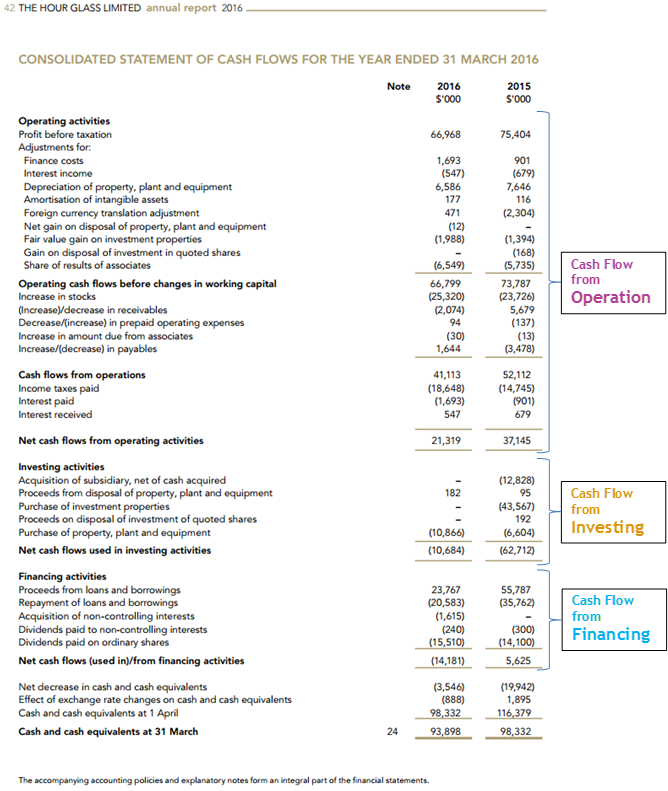 The cash flow statement comprises of 3 main parts, the Operational Cash Flow, Investing Cash Flow and Financing Cash Flow. The operational cash flow can be derived by adjusting the non-cash components in the income statement. Starting with the net income, non-cash components such as revaluation gains/losses, depreciation, amortisation and impairments can be adjusted. Changes in the working capital such as payables to creditors and receivables for debtors are then adjusted to obtain the final operational cash flow. The investing cash flow for a business reflects the cash received or spent on investments. Any cash received or paid due to acquisition or divestment of assets will be recorded in this section. 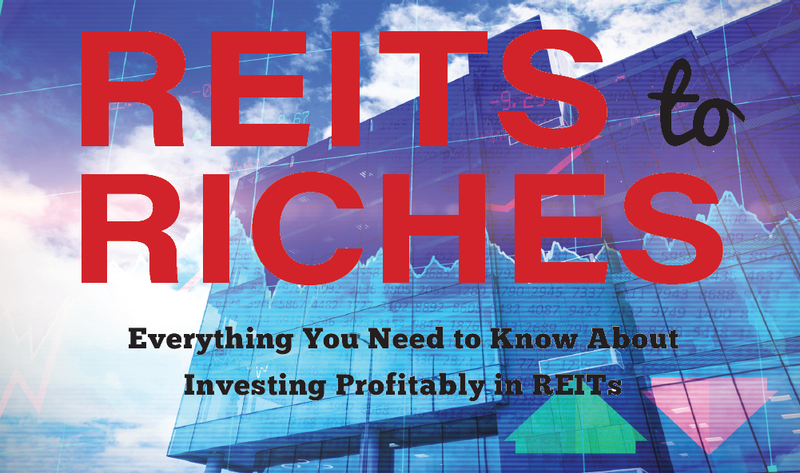 The business’ investment in property, stocks & shares, bonds are businesses that are also recorded here. An important component of the investing cash flow is the Capital Expenditure (aka CAPEX or purchase in property, plant and equipment). Capital expenditures are typically expenses incurred by the business in order to maintain or expand the current business. For example, an airline purchasing a new aircraft for the purpose of upgrading the engine of an existing aircraft will help increase the capacity of the business or reduce the fuel consumption; these expenditures which are capital in nature are not recorded in the balance sheet under generally accepted accounting principles. The rationale for this is that these expenses are investments expenses today which could be utilised by the business over many years. Therefore these expenses should not be accounted in one accounting period, but rather are depreciated gradually over the lifetime of the asset. The difference between the Operational Cash Flow and the Capital Expenditure is known as the Free Cash Flow. Lastly, financing cash flow show changes that are directly related to funding activities. Examples of such activities include payment of dividends, issuance/buy-back of shares, payment of interest and drawdown/repayment of borrowings. 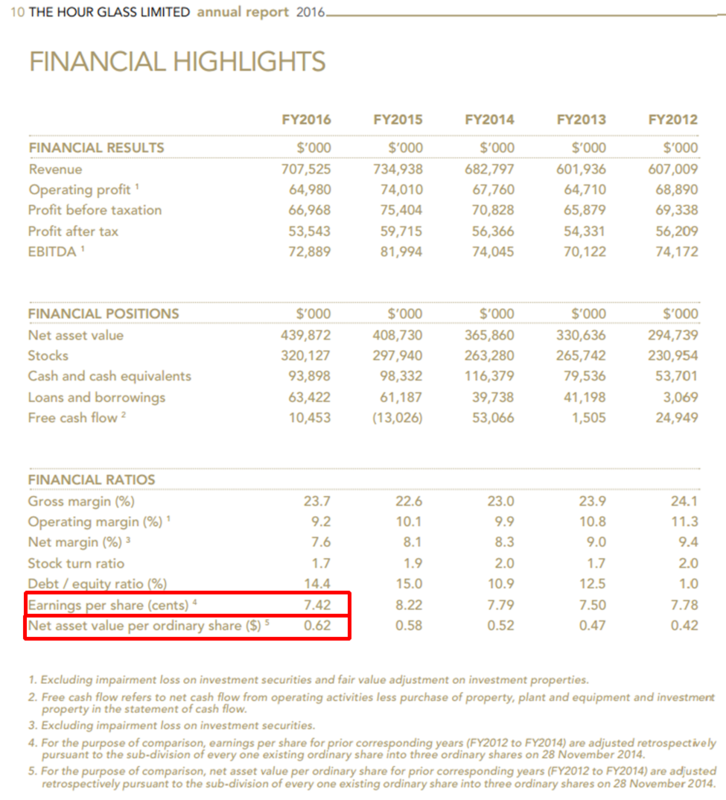 Below is an example from The Hour Glass Limited showing the major constituents of the Cash Flow Statement. These figures are typically published as a calculated figure for investors and can be found within the presentation slides, annual reports and quarterly reports. Below is an example from The Hour Glass Limited showing the figures for Earnings per share (EPS) and Net asset value (NAV) per Share. 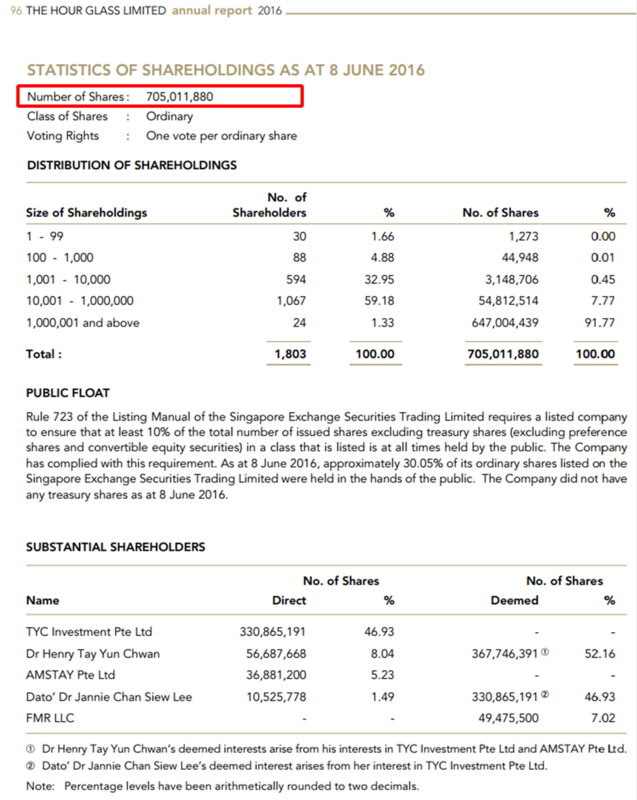 Below is an example from The Hour Glass Limited showing the figures for total number of shares. Financial statements of companies can be found in the Investor Relations section of the listed company’s website or the latest published Annual Report. Look for the latest annual report or quarterly report and download it. Browse through the annual report to understand more about the company’s business. The 3 financial statements are typically found in the latter part of the report under the Financial Statements section. With a heightened familiarity in these 3 financial statements, we can begin to systematically analyse each of financial position of the businesses to assess their financial strength. I hope you have enjoyed this educational piece.